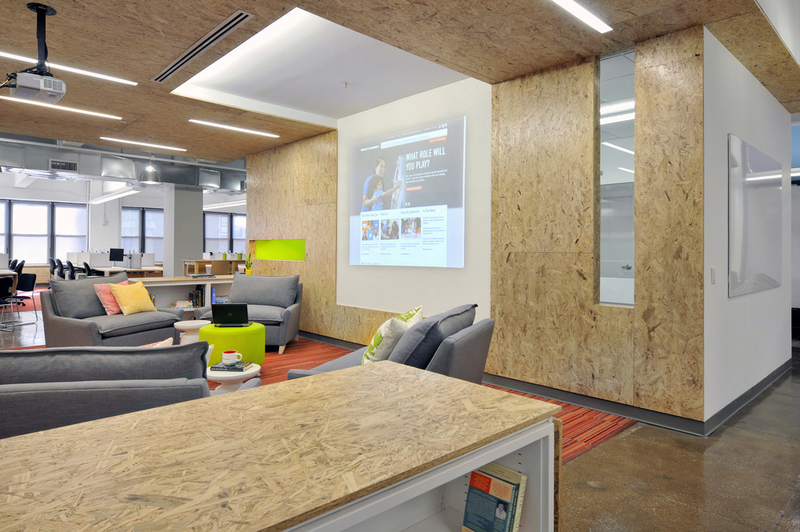 For a large Non-Profit with 100,000 SF in Manhattan, we were asked to re-vision their workplace. Starting with detailed user surveys to over 500 staff and visioning sessions with key stake holders, we questioned the fundamentals: What are the work modes that should be supported? How much time is spent at your desk? How can space support the mission of the organization? And how do we inspire staff, leadership and clients through the spaces we build. The results were surprising: Collaborative spaces were valued over personal space and staff preferred working in a range of spaces throughout the week rather than the home base of the desk. Staff spent more time in a collaborative mode than focused and felt their focused work could occur anywhere, as long as they had laptop access. Starting with the idea that work is no longer tied to a dedicated cube and fixed location, we developed a new workplace replacing all previous standards and assumptions.